On Thursday, a Duck Boat, capsized and sank on a lake in Branson Missouri. 17 are dead, and of the 12 people who survived, 7 are in serious or critical condition. Questions are being asked about the safety of these craft, and given Murphy’s Ambassatours operates several, its worth a look. There have been several incidents involving amphibious vehicles in the last 20 years – in 1999, another DUKW sunk in Arkansas, killing 13. Closer to Home, the Lady Duck Sunk in the Ottawa River, killing 4 in 2002. The DUKWs involved in the Arkansas and Branson Incidents are actually a modern replica of a World War II design. Ottawa’s Lady Duck was a modified Ford Pickup. Halifax’s Harbour hoppers are military surplus Vietnam Era LARC’s, so there are significant differences in terms of the vehicles involved, however a review of the Investigation reports into these incidents reveals similarities. A Transportation Safety Board report into the sinking of the Lady Duck revealed that the vehicle was registered as a motor vehicle only, and not as a small vessel, thus it fell into a regulatory vacuum, and was not in compliance with marine regulations. Additionally, Small vessel regulations were very different in 2002 then they are today. 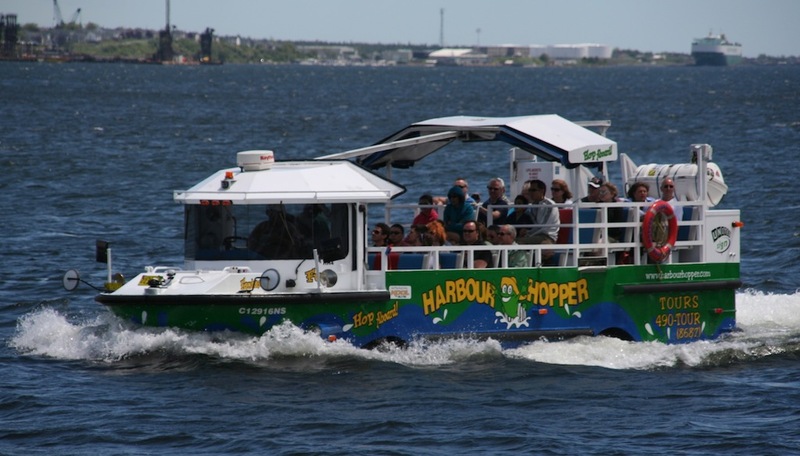 Harbour Hoppers are regulated as Both a Bus (by the province), and as a Vessel (by Transport Canada) and are registered as vessels. The TSB Report into the 2002 sinking of the Lady Duck, echoed some of the recommendations from the NTSB’s report into the Arkansas sinking, and actually included a portion of the report as an appendix. Specifically both the TSB and the NTSB recommended requiring the vessels posses enough reserve buoyancy to stay upright and afloat when flooded, and to remove canopies, or use canopies that will not restrict horizontal or vertical escape by passengers. Additionally, both reports cited a lack of maintenance to the vehicles, specifically surrounding pumps required to remove water from the vessel. The main cause of death in both the Arkansas and Lady Duck incidents was people getting trapped by the canopy, and being unable to escape. 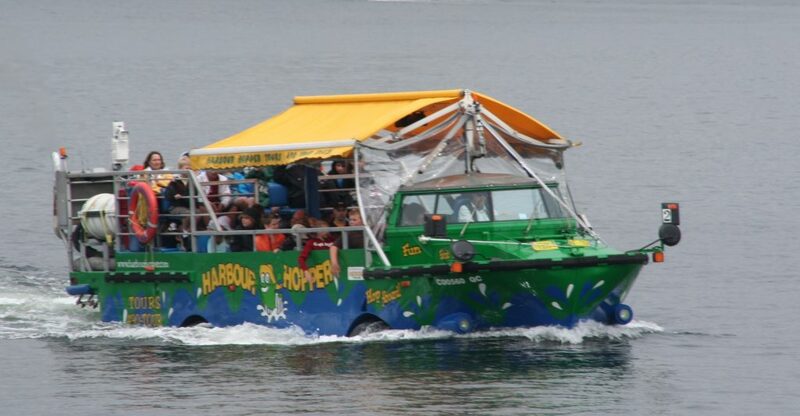 Photos of the Stricken Duck boat from Branson seem to show that the passenger area was fully enclosed on top and on the sides. the Harbour Hoppers use a awning, which is open on the sides. as well as they are registered vessels they must meet construction and stability regulations. I have also been informed that the Hoppers are pulled from the water the moment the wind gusts reach 22 knots / 41 km/hr. That’s a hard cutoff that both the company and Halifax Traffic (the MCTS center that controls ship traffic in the harbour) enforce strictly. The Hoppers are also required by Transport Canada to stay within 150 meters from shore. This is mostly to keep them out of the way of the larger commercial traffic, but it doubles as a safety net where the Hoppers are never more than 30 seconds from a floating dock. Witness reports indicate that waves on the lake in Branson were hitting 6′ in height at the time of the incident, due to a fast approaching thunderstorm. Ultimately the report into this incident will likely sight Weather and the decision to sail, the enclosed canopy, and a failure of regulators to implement recommendations from the 1999 Arkansas incident as the causes. This entry was posted in Uncategorized on July 21, 2018 by Peter.